Studio 101 is the only choice for Hens nights. It’s beautiful ambience and interior (click here to check out some pics) creates an atmosphere only found at 101 where WE create a dance experience especially for you . The Hens party dance styles we offer are below OR liase with us to create your favourite theme, song choice or style that your heart desires. A glass of champagne and some fun dance moves is a great way to start your "BIG NIGHT ON THE TOWN". A deposit of $250 is required to secure dance style with the remaining to be paid on the night. Click here to enquire now! Prices vary depending on activity and group numbers. Click here to enquire now! A great team building workshop utilising a blend of martial arts from around the globe, with the rhythms of dance! These guys had a ball, and so did we! Hamming it up, too funny! "The workshops at Dance Studio 101 are always fun! It's a great way to keep fit with the girls, have a laugh, and a damn good time"
"The smiles of pure delight spoke louder than words as guests of the Longrain Sydney Xmas party were entertained by a fine selection of dancers from 101. The performance got even better as partygoers were encouraged to bust their own moves under the direction of these party professionals. They truly made our night! " "It was an absolute hit to have my girlfriend’s hens party at Studio 101!! We all had so much fun doing Michael Jackson's Thriller dance workshop. It's a memorable experience that I would highly recommend to anybody. Maya is such a great professional dancer, she will look after you like no other!" "Maya and the team at Dance Studio 101 have helped us redefine client entertainment with their dance classes. We have found that learning a group dance routine in a creative and relaxed atmosphere is a great way to build relationships while challenging inhibitions and having a load of fun along the way." "It was amazing to have Maya turn our pre dance nerves into excitement, helping us feel more confident and less anxious about performing our wedding dance". "Starting our Hens night off at Dance Studio 101 was the highlight of our night. Thanks girls, you rock!" "An 80's Solid Gold dance class was the perfect way to kick off my friend's Hens Party. We laughed the entire time, especially when the costumes came out, and are still putting those moves to practise to this day! I highly recommend Maya and Dance Studio 101 for hens partys or just a great girls day out." "We couldn’t believe how one dance class could lift our spirits so high"
""The Beyonce dance workshop was out of this world fun - we had such a great time for our friend's hens party. Maya was super cool and encouraging and the warm up dance exercises really helped us loosen up and get into the spirit! I would recommend Maya and one of her dance classes as the best fun you could have for a hen's party, girls get together or whatever reason you want to do it! It was unreal!" "When Maya appeared, the epitome of Flash dance cool in lycra, we almost couldn’t believe what we had stumbled across. With vintage dance costumes, props and a glass of champagne, the atmosphere is total fun. The Solid Gold course was an awesome team building experience, we all loved it, were totally comfortable and laughed ourselves happy. Pure gold." "Maya and the Dance Studio 101 crew are awesome! Their creativity and flair brings a great level of entertainment to all their dance workshops and they are always able to set just the right mood into any genre they set after! Their interpretations are fantastic and they bring a fun, yet highly professional, attitude to everything they do." 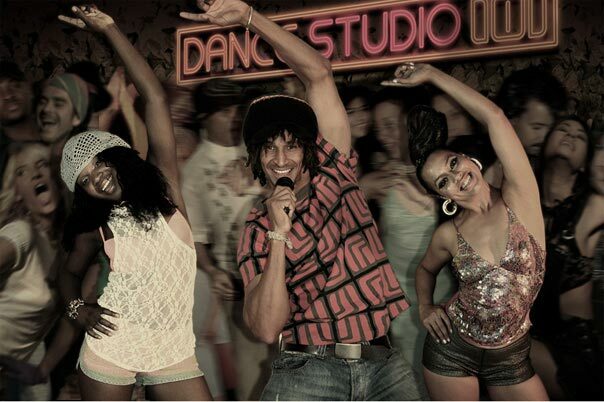 "Our company had the most fantastic time at our Christmas party 70’s dance class! Maya and the team were so great at making us all feel like superstar dancers even though a lot of us had 2 left feet! A brilliant team building activity that you couldn’t help but love." "I organized for my friends hens to start at Dance Studio 101 and we all had a fantastic time! Maya is a brilliant teacher and took her time with us so we could all pick up the choreography. We will definitely be back in the future!" "I love the workshops at Dance Studio 101. My friends and I laughed so hard we nearly had to call an ambulance!" Dance Studio 101 Personalised 10 Class Gift Certificates Now Available!